The floor near our kitchen sink is always getting little drops and splashes of water on it while we are washing up, so this was my solution. 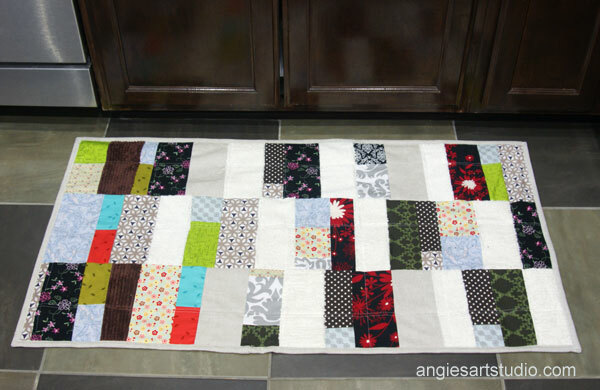 A scrappy patchwork rug! 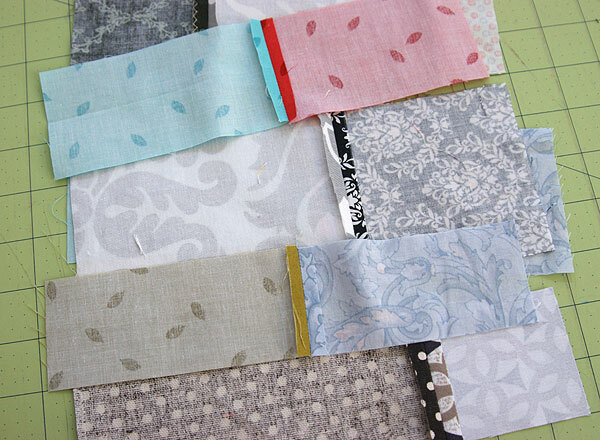 This is another easy sewing project to do and a great way to use up any fabric scraps you may have, especially if you have a mixture of different kinds of fabric. 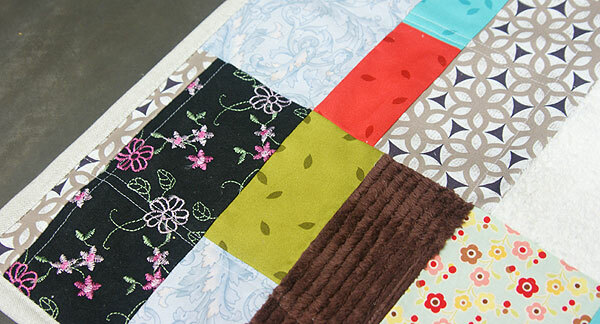 I mixed in quilt weight fabric, flannel, home decor fabric and cotton chenille. I sort of had an idea of what I wanted it to look like and the size of it – mine ended up 45″W x 25″H, but it can be easily modified to be any size you want. I didn’t follow any pattern, just made it up as I went along. 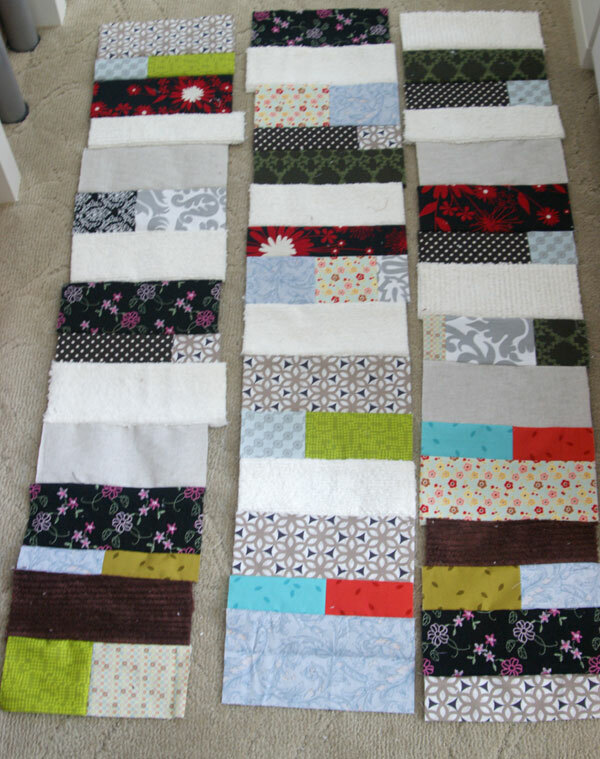 The only criteria I followed was that it would consist of three rows, each row to be made up of strips that would be 9″ long and no wider than 4″ wide. If the strips were not long enough, then I pieced two or more fabric scraps together and trimmed them to 9″ and ironed the seams open. 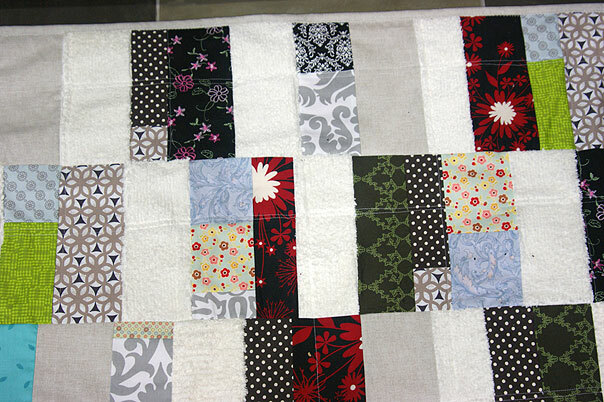 After cutting all my strips, I arranged them in an order I liked and then sewed them together with a 1/4 inch seam to make the 3 rows. Iron each row so that the seams are open. As you can see from the picture below the rows are uneven, so I just trimmed the sides to even them up, sewed each row together and then ironed the seams flat. The middle layer of my rug is a piece of flannel and the backing is some home decor fabric I got on sale at Joanns. I quilted all three layers together, nothing fancy, just a few straight lines going across and down, evened up the edges and then sewed my binding on. 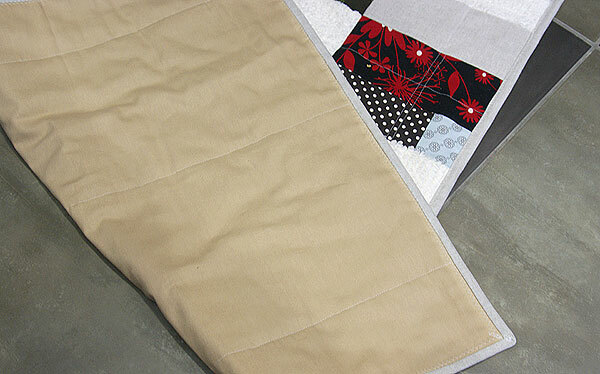 A fairly straightforward and easy sewing project that feels nice under the feet and I think would also make a nice looking blanket just by adding more rows! What a great idea. And beautifully executed.